iTX integrated playout is the world’s most advanced, integrated playout platform for broadcast television, providing outstanding IP/SDI format flexibility and scalability for future readiness, along with end-to-end workflow tools for greater process automation and lower OPEX. Its outstanding playout capabilities are combined with a proven track record, with more than 17.5 million hours of broadcast television delivered by iTX each year. These channels range from national broadcasters and global brands to local stations, and they carry some of the biggest live events on television. With iTX, broadcasters are assured that commercial revenues are protected, while the costs of operation are minimized. iTX On-Demand option reduces VOD preparation time for pre-recorded and live content and enables new revenue streams. For advice on ordering an iTX solution or further information, please contact your Grass Valley office or local representative. 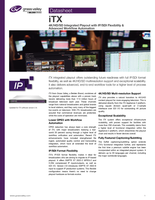 iTX integrated playout offers outstanding future readiness with full IP/SDI format flexibility, as well as 4K/HD/SD multiresolution support and exceptional scalability. It also delivers advanced, end-to-end workflow tools for a higher level of process automation. iTX from Grass Valley, a Belden Brand, combines all the playout capabilities above with a proven track record, delivering more than 17.5 million hours of broadcast television each year. These channels range from national broadcasters and global brands to local stations, and they carry many of the biggest live events on television. With iTX, broadcasters are assured that commercial revenues are protected, while the costs of operation are minimized.